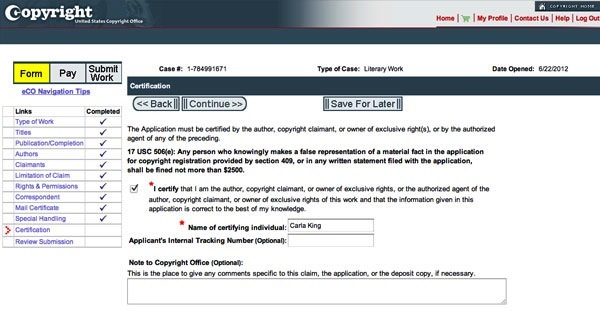 With the perceived risk among writers of copyright infringement so extremely high it’s no wonder self-publishers are increasingly concerned about making sure their work is copyrighted. Copyright exists from the moment the work is created, "without any action taken by the author, the moment it is fixed in a tangible form so that it is perceptible either directly or with the aid of a machine or device." 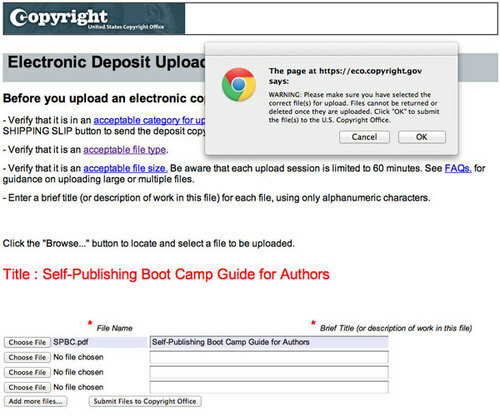 Many self-publishing service companies now offer copyright services, but you don’t need to use them. While they charge up to $150 for the service, it costs only $35 to easily do it yourself. You don’t even have to put a copyright notice on your work, though it does ward off potential word thieves. 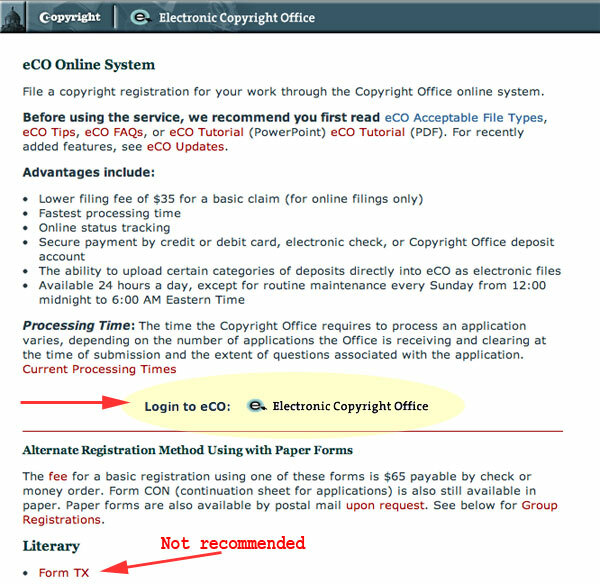 In case you anticipate a lawsuit, or just want that extra protection, here’s how to register for $35, in about 35 steps, as it so happens, and coincidentally, it took me about 35 minutes, too. 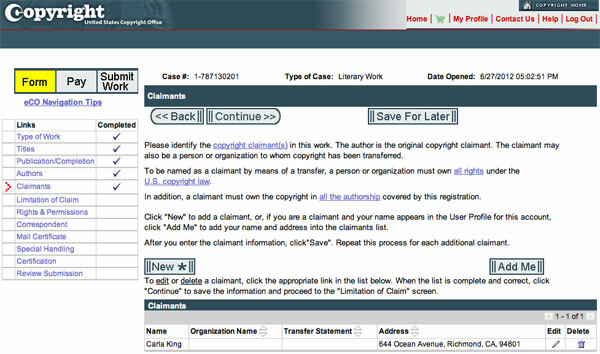 Note that while this example pertains specifically to authors, you can register works of visual arts, performing arts, sound recordings, and single serials at the same website. 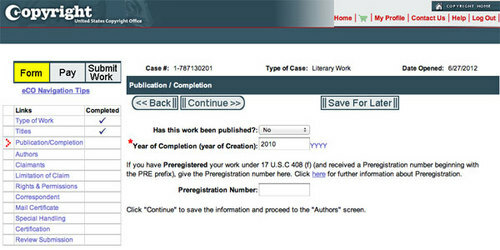 To get started, point your browser to the US Government’s official copyright registration page. Click Login to eCO: Electronic Copyright Office. 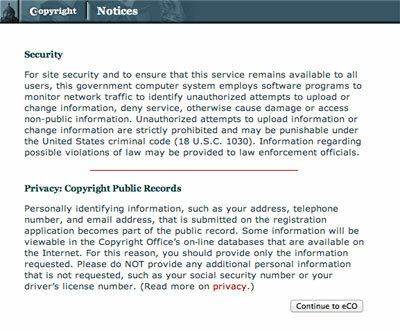 It’ll take you to a security and privacy notice, click Continue to eCO. Note that, at this writing, it takes them 3 months to process electronic filings, and 10 months (plus $65) to process paper filings. If you have not registered before, click New User to reach the Welcome screen and register a new claim. 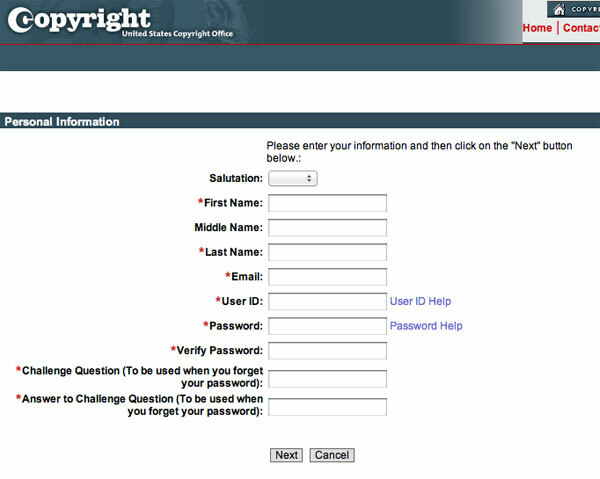 Once the Welcome screen appears, select from the list on the left of the screen, under Copyright Registration. Under that, click menu item Register a New Claim, which will reveal the Personal Information screen. Now fill out the Personal Information form, and click Next. Finally it’s time to Start Registration. This screen is a little confusing. 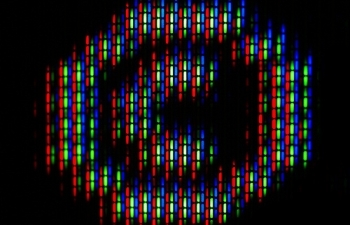 The Step 1, 2, 3 links just take you to help screens. 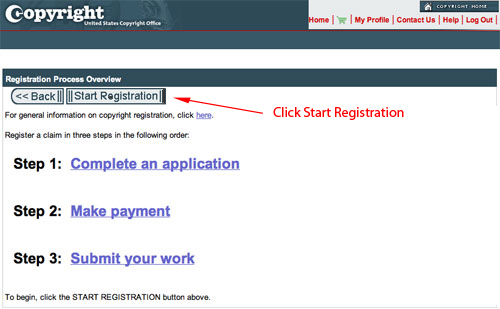 Ignore those, unless you feel you need help, and click the gray button at the top marked Start Registration. This will launch the Type of Work screen. 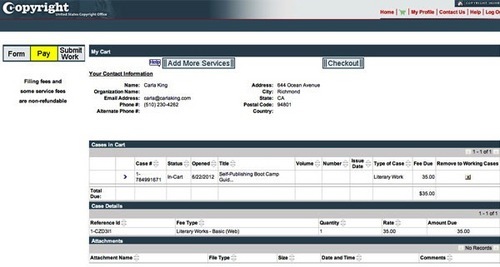 The Type of Work screen is the first of many in the series of screens that provides details about your book. Notice the menu on the left with the headings Links and Completed. That’ll stay with you the whole time. The system makes you complete each step in order, or sometimes lets you Save For Later. Once you’ve completed a step, or saved for later, you can click back and forth among the steps. On this screen, if you’re a book author, you’ll choose category Literary, though you can see that visual arts, music, videos, and other works are eligible for copyright using this form. Use the dropdown menu at the bottom right of the screen to choose Literary, and then look up at the top of the screen again and click the gray Continue button. Now you’ll be asked to enter the title of your work. You’ll see now that the screen has changed, the red arrow on the left-hand mini-menu has moved down to the Titles screen. This red arrow shows your progress through the registration process. The next series of screens defines your book title. Click the New button. 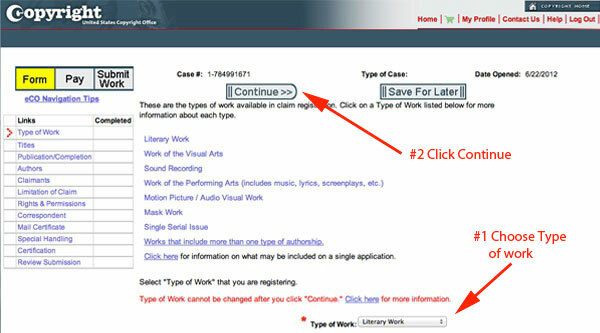 The following screen will ask you to choose the type of title you are sumbitting, and to enter the exact title of your work. Most of us will choose Title of Work Being Registered from the dropdown. Then enter the title of your book, exactly. Finally, click Save and the screen will refresh, displaying the Title of Work. You can add more titles, if needed. Review the titles carefully, making use you’ve correctly entered your title. Use the pencil and trash icons at the far right of the screen if needed. Once you see the titles correctly displayed at the bottom of the screen, click Continue to move on to the Publication / Completion screen. Once on the the Publication Completion screen you’ll see that the first two tasks (Type of Work and Titles) have been checked off in the mini-menu to the left. Now it’s time to indicate whether the title has been published or not. If you answer no, you’ll be asked to provide the year of creation/completion. 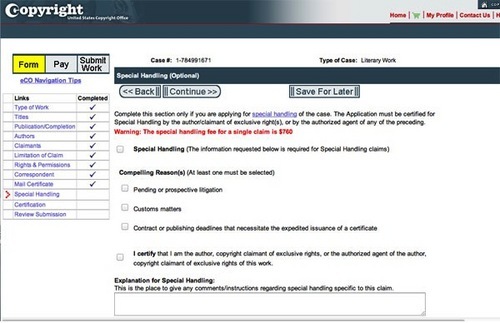 If the title has already been published, fill out the required information — everything marked by * is required. And hit Continue to move on to the first Authors screen. On the Authors screen click the Add Me button. If you’re not the author, click the New button. 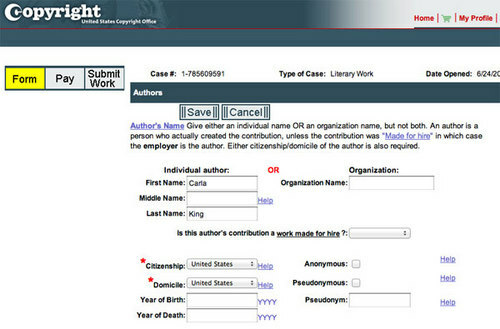 Make sure you name is listed correctly, and indicate your citizenship and domicile and click Save. Now specify exactly what you (the author) created: text, editing, photos, art, etc. Click the Save button once you’ve specified, and repeat for each additional author. Once you see all the authors’ names listed at the bottom of the form here, click Continue. 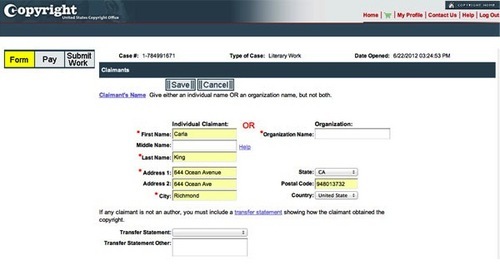 Now the Claimants form appears. Use the Add Me button to add yourself, or New to add someone else. Fill out the form with your information, and click Save. Now you should see yourself listed as a Claimant, so click Continue. Now the Limitation of Claim form appears. 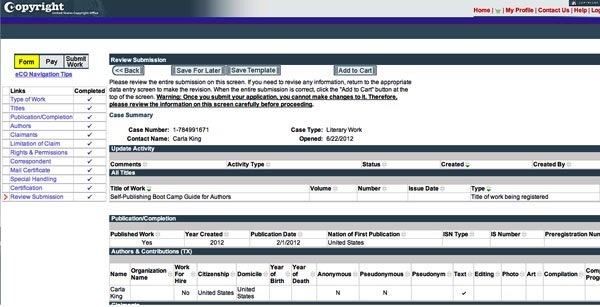 Here’s where you can exclude material in your book from being copywritten in your name. You can also include new material for a previous copyright registration. The links on this page go to thorough help pages that explain. 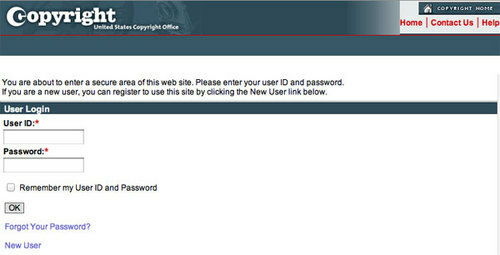 Most of us will leave this form blank and click Continue. 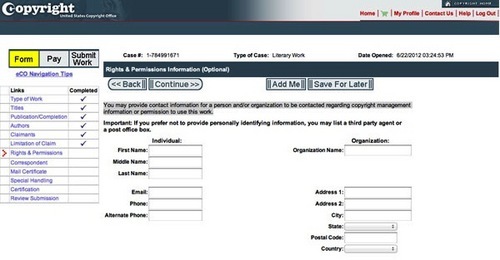 On the Rights & Permissions screen you can add somebody to contact other than yourself to discuss copyright. You may provide contact information for a person and/or organization to be contacted regarding copyright management information or permission to use this work. Click Continue to move on to the Correspondent screen. 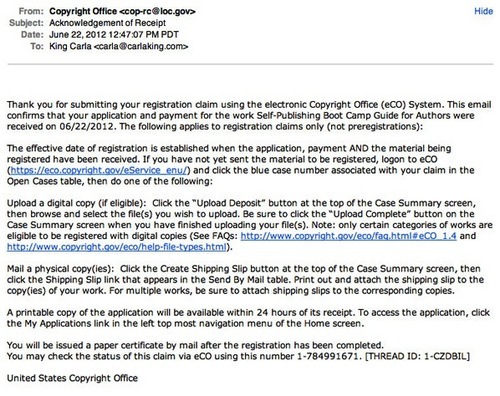 The correspondent is the person the copyright office should contact if needed to discuss your copyright claim. 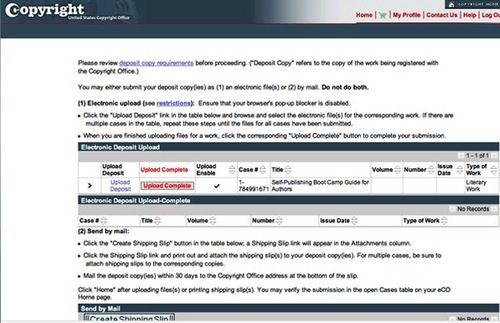 Similarly, the Mail Certificate form indicates who the form should be sent to, and the address. The next form is very special, and very expensive. It’s the Special Handling form. The $760 fee discourages the choice. So unless you’re in the middle of litigation or you’re rich and impatient, click Continue to move on to the certification form. 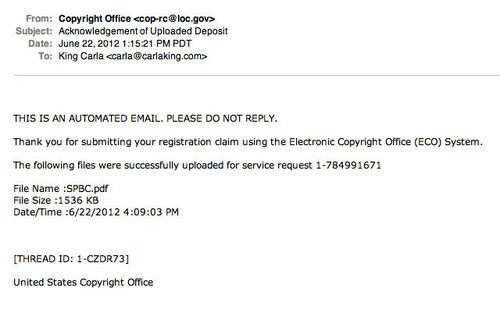 On the Certification form confirm that yes, you are the authorized agent for this copyright registration. You can also leave them a note, if you wish. Finally, now you get to review all your information. On the Review Submission form you can click back to make sure you’ve filled everything out correctly, using the menu to the left to navigate among the forms you’ve completed. Once you’ve reviewed and confirmed your information is correct, scroll back up to the top of the screen and click the Add to Cart button. The payment series of screens will be launched, First, confirm that your contact information is correct, and click the Checkout button. You can pay with your checking account by clicking Pay – Deposit Acct or click Pay – Credit Card / ACH to use plastic. 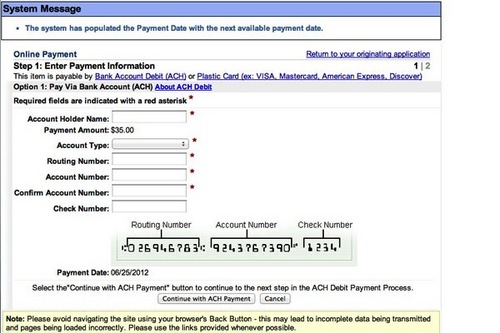 Once you’ve chosen your payment method, you’ll be warned that you’re leaving the eCO system for the U.S. Treasury site payment system. Click Okay to proceed. 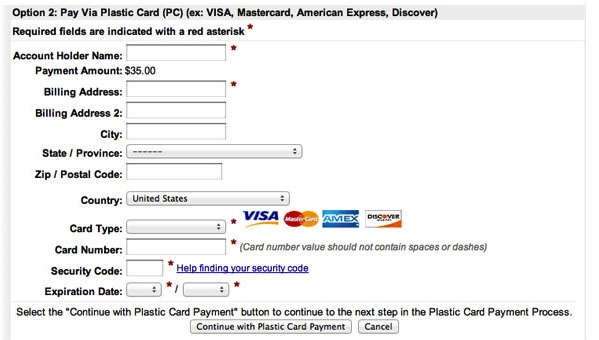 Now you get to enter your payment information. 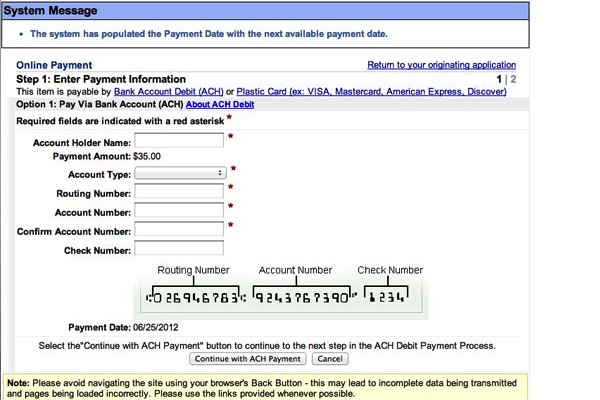 I opted for plastic, but this is the screen you’d be faced with if you wanted to use your checking account. Here’s the credit card form. If you pay for things on the Internet, it’ll look very familiar to you. Once you click the Submit Payment button at the bottom of the screen you’ll be taken back into the eCO Copyright screenset so you can upload your book. 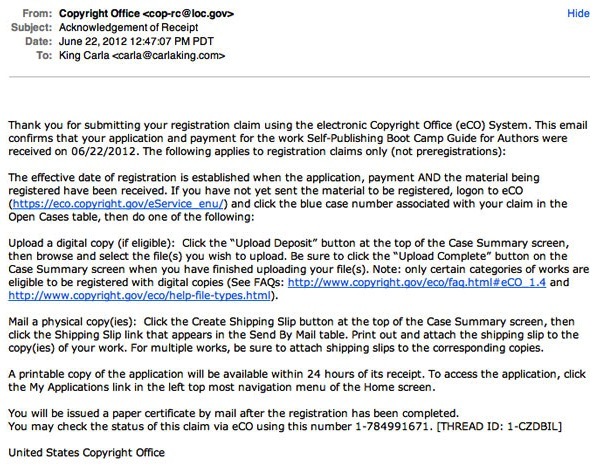 Though it is an option, registration by mail is not recommended as the government copyright office is so extremely overwhelmed. So click Upload Deposit. 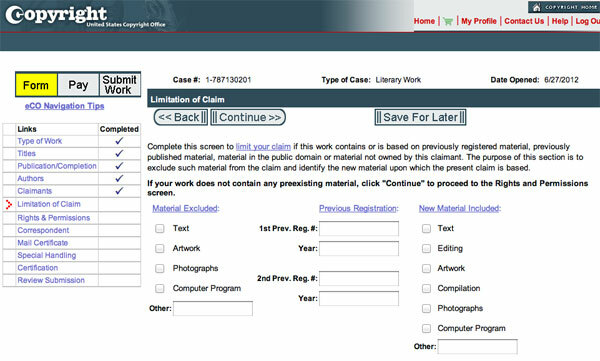 The Electronic Deposit Upload screen lets you navigate to your computer hard drive and choose your book files. 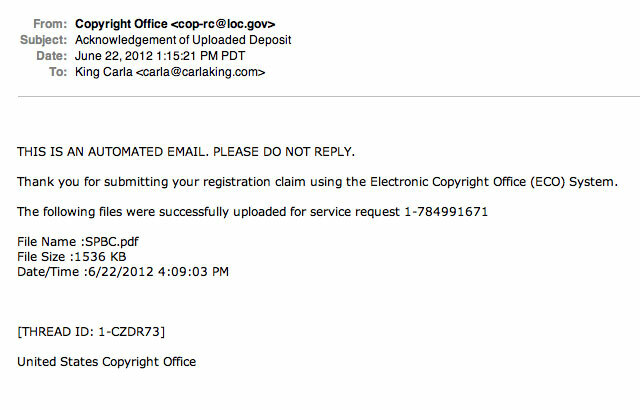 After I submitted my files I didn’t click Upload Deposit like I should have, and got lost. After a moment of hopeless resignation, I found an email in my inbox that showed me how to get back to my account. 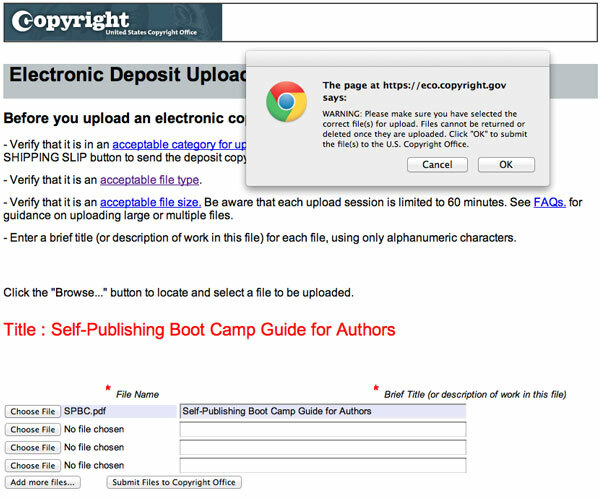 This time I clicked Upload Deposit and chose the PDF file of my book (cover and interior file, all in one, though I could have uploaded them separately), clicked SUBMIT FILES TO COPYRIGHT OFFICE, and got the warning notice saying I’d better be sure that I’ve uploaded the right file. I was ready to do it, clicking okay, I’m sure those are the right files. Once they were uploaded the system helpfully confirmed the upload, and that was that..
At least, until I got the final automated email. Success! 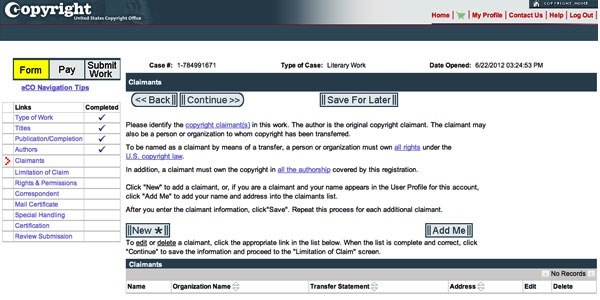 Between the time you pay for your copyright registration, and three months from then, check your case status by logging in and clicking All Cases in the Check Registration Case Status menu at the left of the screen. Here’s the U.S. Government Copyright FAQ, too, in case you need it. Are you Canadian? Here’s their site. Australians, look here. New Zealanders have similar rules. In the UK, you’ll go here. Carla King is an author, a publishing consultant, and founder of the Self-Publishing Boot Camp program providing books, lectures and workshops for prospective self-publishers. She has self-published non-fiction travel and how-to books since 1994 and has worked in multimedia since 1996. Her series of dispatches from motorcycle misadventures around the world are available as print books, e-books and as diaries on her website. 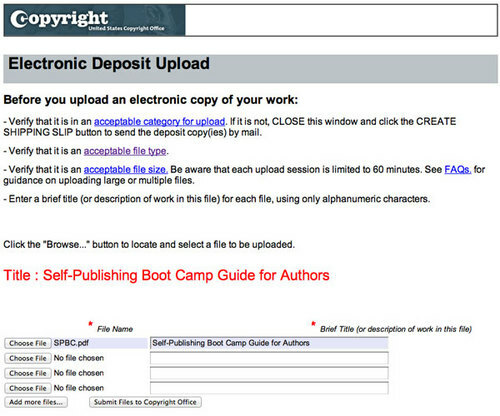 Her Self-Publishing Boot Camp Guide for Authors was updated in early 2012 and is available in print and online at the usual resellers. Her next workshop is in the SF Bay Area at Stanford University on Saturday July 14.